“A little sister always looks up to her big sister, no matter what age you are,” says actor Kristen Bell. Recently, the former Veronica Mars star and voice of Anna in the Disney hit Frozen decided to show her appreciation for her big sis Sara by surprising her and her family with a full-on basement renovation. “She’s honestly in my eyes a superwoman,” Bell says. This was an amazing story. Kristen is the real deal! We need more actors like you that are unselfish and care about more than their careers and politics! LOVED the basement! This is a great overview of how Houzz works. Growing up in Metro Detroit it was fun to see a local celebrity helping out her family and seeing familiar sites - JD. I am so proud of you Kristen! Such a sweet storey! Looks fantastic! your awesome Kristen, brought a tear to my eye. Aunt Kristen, you ROCK! Melissa took your vision and ran ... really incredible transformation of a basement. Very inspiring! How cute ! What a great sister ! So proud that our Aria Prom Prom window curtains were used. Great job, Kristen! WOW!!! Kristen Bell is AWESOME ... and Houzz .... YOU ROCK!!!! What an awesome sister you are!! That was great. Loved it! What paint color was used on the basement ceiling? Looks great! Brought tears to my eyes. Sisterly love! Thanks for sharing with us Kristen. @shewitt2 glad you like it! The paint color we used on the basement ceiling is Match Benjamin Moore CPS-185. Hope this helps! I ❤️Houzz! Such a beautiful story of sisterly love. Cozy, Fun, Functional Basement. Perfect Episode. First and foremost.. Houzz TV? I've been on this site for a while and didn't know there was a houzz TV. Very exciting. Looking forward to what else is in store. Ashton Kutcher as the director. THE Ashton Kutcher? The transformation is amazing. My favourite has to be the yellow wall. I caught a glimpse of it in the video and had to pause to look at it. I'm a suckered for bright colours. The rug in Lucy's room is gorgeous. This basement layout is so sensible. They must feel like they have a brand new home. loving this video feature on Houzzz. just when ai thought I couldn't love this app more :-) great job on the reno! We are SO THRILLED as the great feedback from the renovation we did! Thanks everyone for the nice compliments!! Kristen Bells sister and her family were at our design studio today for a viewing party. I can promise you that they are so touched by this project and appreciate this new space more than words can say. Lovely family and they deserve all the best in the world. Love the work you did in the basement! Can you tell me about the basement floor? What was used there? Thanks for showing an average suburban metro Detroit house for a redo project. My first reaction to the lead photo was recognition as it being local to my area. It encourages the average person that they also can have inviting spaces without living on either Coast. The designer, Melissa, did an awesome job. LOVE that they have a second bathroom now! That is SO COOL!!! Hi Gina Wallace, we used clear epoxy on the floors with no stain. Hope this helps :)! Melissa and Meadowlark did such a phenomenal job. This was awesome! How are the floors finished? A heartwarming story and a wonderful overview of how Houzz works. My husband and I used Houzz with our contractor when renovating our kitchen, bathroom, and pool area. "A picture is worth a thousand words".....so helpful when deciding what will and won't work. Amazing transformation. Love that it showcased Houzz and a normal family home into a beautiful but completely livable space not an untouchable magazine page. Well done to Melissa the designer for pulling it all together. Such a sweet touching story and amazing transformation. Congratulations to the family and the designer. Thanks for sharing. Well, that was just the sweetest thing ever, and very well done! Nice one. Reminds me a bit of fixer upper and a tad to much houzz self-advertisment for my taste, apart from that it was pretty cool. Exec Producer listet Aston Kutcher. THE Aston Kutcher or do they just share the same name? Love this story and design. Nice to see elegance in a family friendly room and I agree it is so great to see a redesign on an average home. Most redesigns show homes out of reach of the average homeowner. Thank you to Kristen Bell and her family for sharing this. Everything is absolutely beautiful. My dream is to do something like this for my mom. Loved what Kristen did for her sister! Very needed. Very emotional! Made me cry! I Love makeovers if all kinds. I Love Houzz. Home is the place you are drawn to. Home should be a vacation. Kristen Bell your quotes are spot on. What a wonderful gift to give to your sister, brother in law, nieces and nephews. Best gift ever. wow! I knew this Detroit as soon as I saw the house. this is a similar floor plan to my first home in Oak Park. Kristen Bell is officially my favorite Hollywood star!!! To be selfless and do this for her sister was amazing! And knowing that she grew up in the D makes it that much better for this Grosse Pointe Park, MI Houzzer!!!! You go girl!!!! Amazing. I love this basement reno, very achievable. I really enjoyed watching all the elements that went into this surprize. I'm a big fan of Kristen Bell and her husband . Such a beautiful thing to do for someone you love and someone so deserving. I like the way the designer and Kristen could work together with houzz. I would consider trying this myself. The designer Melissa was very open to Kristen's idea and she made it real. Thanks for sharing. The Painted-out ceiling is GREAT! As a realtor we have advised clients to jazz up their basement spaces with this, but we did it in black (as per another HOUZZ article) The white is great... I would recommend this treatment in a flash, and also know that if in an older home where the basement is not so high, we can still put in some recessed lighting here and there between the floor joists....! Bravo! That pulled on my heartstrings - what a fabulous transformation! Love this. Home should be a place you escape to...I couldn't agree more! A story that unfolds to a beautiful gift! Beautiful re-design! What a thoughtful, heartfelt gift. The designer, Melissa, could be a twin to Anne Hathaway - talented and so beautiful! You hit it out of the park! Where is the new laundry room? Love Veronica Mars, the whole sloth thing and now this. Kristen Bell is the greatest. Sarah's house looks so much like my little bungalow I had in Rhode Island. I had the same huge basement that I didn't do enough with. Wish I had seen this back when I lived there. Awesome family Kristen,I am a fan of yours, saw some great ideas for my basement. This is an an incredible transformation! I love how open it feels and that every space was used to achieve lots of needs for this sweet family. It's amazing how much bigger the space looks even as it offers more uses than the previous space because no space is wasted! 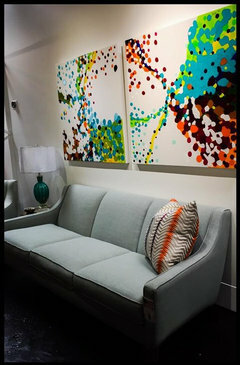 I especially loved learning how useful and wonderful HOUZZ is for more than just inspiration photos. Melissa did an amazing job working with Kristen. I enjoyed seeing how this all came together. Thank you! really sweet story and a beautiful family and a great functional design. I love the lamp by the sofa. I love the wall décor in Lucy's room (esp that fun abstract-like painting)...do you know where that is from? Lovely make-over and great ideas!! Well done to the designer and to the actrice!! I love Kristen's Bell's definition of home, and I love how she walks us through the inspiring reno of her sister's basement with the help of Houzz! Good looking girl and smart-looking projects. Impressed. Very impressed. Tons of love put into this project making it a beautiful renovation. What a great gift to a deserving family. Great job to the designer and houzz! What a delightful, heart-warming story giving me reason to love Kristen even more. It's encouraging to me that we could open our basement ceiling as they did and get rid of ceiling tiles. God bless everyone involved. Great job. I like to watch this side of celebrity life. To see that they have regular siblings, regular parents who have a life like any of us, who live in a houses like most of us. I love to see how well-to-do Hollywooders help their family members who stayed in their hometowns to live an ordinary life. I love how stars talk about their family members, with warmth, respect, and love. It's like they talk about me because I can relate to their relatives. Keep doing these episodes, Houzz TV! Wish I had your eye for design Kristen ! You and Melissa did a beautiful job. It especially touched me the way you created a space for your niece. Congratulations on a wonderful job, and for being such a great sister ! executive produced by ashton kutcher! whaaa! also, love KB, and love what they did to that house! What an amazing story of love and family. I may have cried...a little bit...at the reveal. Well done Kristen and Melissa!!!!! Aww! I actually watched the whole video! Love Kristen Bell (and her show!) and this was so sweet of her. And Houzz, the designer, Kristen, and her brother-in-law did such a great job! I want to do it to my basement! Now I only need my sister to fund the whole thing. hee. What a wonderful thing to do for a sister! Loved it. Beautiful! Thank you for sharing Kristen! And thank you Ashton Kutcher for producing ~ great job! Wow it is a wonderful Project, this is an awesome job, congratulation. I had a good cry. Creating a lovely environment shows how we value the people living there. Space matters because people matter! Nicely done!!! This is exactly how I feel about my sisters! What a beautiful thoughtful thing to do for them. Brought me tears of joy! Here's to sisters❤! Now I love Kristen Bell even more! Such a sweet and inspiring video. A very wonderful video. Love between sisters has no boundaries. I know little sister is so happy to thank her big sister. Houzz you did a fabulous job. I love her given spirit. Now I want to upgrade my basement. This was really darling. I didn't know Kristen Bell was so adorably kind. If you like before & afters & joy, you'll love this! Fantastic!!! Great job EVERYONE ~ of course, family is everything so I definitely am wiping away happy tears. I think Houzz will continue to flourish and grow - I am amazed by the effectiveness of bringing the vendors, examples and ideas together to make the idea book become a reality just by clicking on it. Thank you! Such a beautiful and touching story about the love of family. To do something like this for family is so awesome. So, when I finished crying, I only smiled. What a fabulous story. This is spot on! I love the Houzz has helped me communicate my ideas clearly while working on our new house. Life would have been much more confusing and expensive, considering I would have purchased about a hundred more design books had I not had the Houzz site. More please!!!! Great design, great family and great sister! all the design-piration - This is awesome! can anyone tell me what they did to finish the floor in the basement. Love it! I'm in the midst of renovating my basement and need advice on what to do over unlevel concrete floor with low ceiling. I loved this story...great job! Absolutely fantastic! The makeover is gorgeous and makes the most use of the basement space. Great job Meadowlark Designs! Question - What photo did Kristen use as inspiration for her niece's room? Loved the transformation. Great job by Meadowlark Design+Build & what a thoughtful sister Kristen Bell is! What a great video! I use this app to show my customers ideas in the construction/design business. They love how fast I can show them what a particular design will look like. Thanks Houzz!! Awesome story and renovation! Brought a tear to my eye as other commented. lol Excellent job to Melissa Kennedy, reno workers, executive producer Ashton Kutcher and mostly Houzz! Loved this! 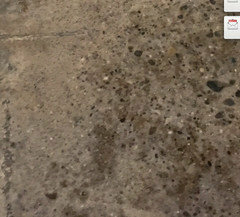 Can you please post a close up picture of the concrete floor in the basement that you fixed up? What process did you use, and how long did it take? Beautifully done! But....I do* have a question....Where did the washer and drier end up. I didn't see them in the reveal. I love Kristen Bell in The Good Place and after watching this I love her even more! The shots of Downtown Berkley and Royal Oak got me excited. Great remodel, loved how all the colors came together to make it so bright and fresh feeling. The process for the floors was to sand the existing concrete then add clear epoxy finish. Attached is an up close picture of the floor. Hope this helps :)! I have been on the Houzz website for almost two years now after seeing a redo that Ashton Kutcher did for his mom. For the most part it is a very user friendly website and I have 'built' a Dream House that will never be built. With this site and an active imagination it has been an education and loads of fun. Kudos to the stars for doing such a nice thing for their families! What an awesome thing for one sister to another. Sisters are the best. You want to help them when you can! Thank you Kristen Bell. and Houzz is awesome too. I teared up, cause I love my little sister like you love your big sister. Wish I could help my sister, and I do in small ways. Love and hugs to you all. Fantastic......all around! What a wonderful gift! The transformation is amazing. Great job to Meadowlark and Kristen for their collaboration efforts! Hi @Mcharlieferret! The laundry area stayed downstairs. You can catch a quick glimpse of it at 15:41 in the episode. Hope that helps! Sister Love is the best! This made my day. Houzz is the best online product and care service!!! Would love to see her do more shows. So, did anyone else notice how much Melissa Kennedy (the designer) looks like Julia Roberts? That fantastic smile especially! LOVE LOVED LOVED this entire piece, the back story, the fact that it was Kristen Bell (who doesn't love Kristen Bell??) and of course that Ashton Kutcher is behind the scenes....nothing but pure awesome! Aaaannnnddd I love Kristen Bell even more now. What an amazing, sweet family. This was very touching and the reno was beautiful. Very well done. This project illustrates to true beauty and power of Houzz. The designer made great use of the space, listened to the needs and delivered. I am glad Kristen Bell shared her story. Amazing renovation! Sisters are the best & Kristen Bell is Sister of the Year! And Lucy must think you are definitely the "cool" Auntie Mame! So sweet! Glad I saw this today, a day where we have been celebrating womanhood, sisterhood and empowerment. Thank you for sharing and exemplifying what we as sisters can be and should be to each other. Awesome! I'm going to use this to help design my guest room and formal dining room. Hey, Ashton, wanna come film our new design? New home. Empty rooms. Help needed! Kristen Bell inspired me so much that I am treating my mom to a new kitchen. Thank you Kristen and Houzz! TripleTree Interiors & Millwork Inc. This video was nothing shy of amazing!! It felt emotional to follow this journey... the love and respect Kristen has for her big sister is exemplary. The finished result was perfect, thank you for the inspiration. The power of HOUZZ!! Love it!! What a fun surprise. I think people forget that celebrities are people too with real lives and real families. So great of her to let us into her life and the life of her family and share this wonderful transformation with us. I love the way they took the space and they made it appear even larger than it was and also increased usability. And of course every girl needs her own space, so that was a great addition. We don't have basements here in Dallas where I live and I have always envied those that do - it REALLY adds to your space options. Great job and kudos to Kristen for being so generous with her family. So very very awesome. You did a great job, its beautiful. This was such a sweet thing you did for your sister, Kristen. Love it! Wow great use of the basement absolutely love Kristen Bell and definitely the right choice not lining the roof! It's really sweet what you did for your sisiter and I also got an idea. Kristen Bell is awesome!...doing this for her sister shows that she is not only beautiful on the outside but inside as well. What a great example she is for sharing her wealth and success in life with her sister. Goes to show that they have a fabulous sister/sister relationship. Thanks HOUZZ for this inspiring piece! What a wonderful story of love and generosity and the amazing things Houzz can inspire! Thanks for sharing! LOVE the renovation - so beautiful for this family! Kristen, I love you even more, now that I know the person behind the actress. Totally inspirational, and I learned a few things too! I love the barnwood end tables and industrial silver pipe lamp... can I purchase on houzz??? Amazing transformation, love the art work too. That was delightful to watch. What a lovely family! Any DIY advice on how to remove the ceiling panels in a basement, and paint it all to cover up all the electrical, duct work, etc. ? What an awesome gift from one sister to another! Such a wonderful gift Kristin gave to her family in Michigan! I loved that the entire story was shown from start to finish. It's great that there are contractors working with Houzz to complete a project such as this! I loved this...how beautiful...both the renovation and the family! This is wonderful. Kristen + Houzz are great! I've used Houzz for a few years now and learned new tricks watching this! Kudos to the designer, this turned out really beautiful. I really loved the open ceiling! Great video all around. Lastly to Kristen Bell, what a heart! Have you ever tried to tell someone about the multi-faceted Houzz? This video, in the most efficient and non-invasive way, showed what could be utilized by Houzz website; it was covered quickly up front, and then the remaining bulk of the video was all about the transformation. Nicely done. Precious family. Beautiful job Melissa and Kristen. Love this story, and sweet family love! The basement rocks, a great family living area!! Kristen that is so sweet. I wish I could win the lottery because I would love to help my family like you helped yours. Very thoughtful. God Bless. Keep up the goodness. Awesome story!!! Love it so much, I am sure Sara's family is already making beautiful memories in that great basement! such a great aunt and sister ! love it ! the work on the basement was great and not a part of the family but I definitely feel connected through houzz and it's expert design advice. wish I live in the US. I love everything about this video. Thank you baby sister for making big sister proud. Beautiful family and great remodel! Where did the laundry room go? I was hoping for an improved, functional space for laundry duty. @hanksne You can catch a glimpse of it at 15:41. It's still in the basement, but wasn't shown fully. It's beautiful! As the oldest of three girls too I feel the love in this space. Well done! Thanks..I completely missed that when I watched it when it first was released last week. I'm in tears because the basement as cool and as functional as it is, pales compared to the genuine love that you showed your sister and her family! amazing renovation...loved it loved it loved it! Fab aunty & sister. Looks great! I did not know that the Houzz app did all that! That mirror in the bath is EXACTLY what I have been looking for for my long corridor. Beautiful story! I absolutely love the design that incorporates the entire family. It's all about bringing everyone together. But, what I truly love the most, is the love shared between sisters. The respect they have for each other is so evident. I so wish I had a sister. Loved the video and you are a wonderful sister! A wonderful transformation, and a beautiful gift! watching the video bring tears to my eyes. what a beautiful, generous sister Kristen is, and what a beautiful, loving family she belongs to. so obvious that they respect and love each other. Cutest family & "I love Lucy!" ....she's adorable! What a wonderful story. Having three children myself and one with disabilities I had a little cry watching. You are an amazing little sister and one of my favourite actresses. Now that is what sisterhood is truly about!!! @meadowlarkdesign-what is the color used on the bathroom-it is the perfect gray! We have been using Sherwin Williams with all our remodels but might be switching over since using houzz. I love how they pull the colors from each project and post them on the side. I have always been a HUGE fan of Kristen, but now??? HUGER!!!!!!!!! The greatest gift is "giving" - especially to someone who is so deserving. And HOUZZ....well....you are the BEST!!! I have been on your site since inception and it is my addiction!!!!!!!! @Wendy & Dan Dunmire, we used Bruton White, CW-710 on the bathroom walls and Swiss Coffee, OC-45 on the ceiling. Happy painting! I loved the open ceiling. It doesn't feel like a basement. Great job ! Wow, Kristen Bell is so inspiring! What a lovely gift- the remodel looks absolutely stunning! Love, Love, LOVE! ...Question, "why didn't someone warn me that I would be crying during the video?" Simply Beauty-Full! This is an amazing story! Beautiful remodel! I was tearing up! So nice ! We were so overjoyed and honored work with this family. It was a transformational project! Call us for your next custom home or remodeling project in Metro Detroit. Loved this story. How very special for both sisters. HI Dduren, it's a function of how smooth you polish it. If it still has some natural concrete texture it is unlikely to be slippery. We hope this helps! Have fun with your next project! So sweet! Love the new space. Looks fantastic! I've just discovered My houzz and probably will be binge-watching all of them rather than Netflix. Having two sisters also, I very much related to this story. Well done Kristen, Melissa, Tom, and houzz!!!!! I grew up in Redford Township in the 50's, not far from this Detroit home in a similar looking house. I loved how the renovation turned out and I'm sure that Kristen's niece will love her new room all to herself. I hope they made the walls and door to her room sound proof to block the tv and game room noises. I retired to a new home in southwest Utah and Houzz came in handy to come up with ideas, even what I'd like to do with my tiny backyard someday when I have the money. I also used Houzz to educate myself on how much things costs nowadays and to find less expensive alternatives. Great amount of space. Really good ideas to create 'new' rooms. Plus the designer looks just like Julia Roberts when she's smiling! Kristen, You are a wonderful sister, Beautiful Design. Produced by Ashton Kutcher?! That’s unexpected! I just love Kristen Bell! I think what you did for your sister was great. You brought tears to my eyes. I had a older sister who dies at 47 from ovarian cancer. I would do this for her too. Both of you are so lucky to have each other. Stay close. This brought me to tears, as the younger of three sisters myself I've always tried to give the best to my sisters and to see Kristen give to her sister something she'd never ask for speaks volumes to how well you know what would make her happy, AWESOME!!! Thank you for sharing, what a wonderful story! Very cool!! and soooo sweeeeeet!!!! What color did you use on the wall? Specifically, the color in the family room area behind the couch. Thank you! this was awesome kristen much respect great job guys i love it. How true are the COLORs on Skype? Color's vari depending on the medium. Very good. Should I cry? Good job. Please provide subtitles/closed captioned for your deaf and hard of hearing fans. Hi @ellejobarc Thanks for reaching out! The video has subtitles available. Please click where you see the speech bubble near the bottom left corner of the video to turn them on in your language of choice.